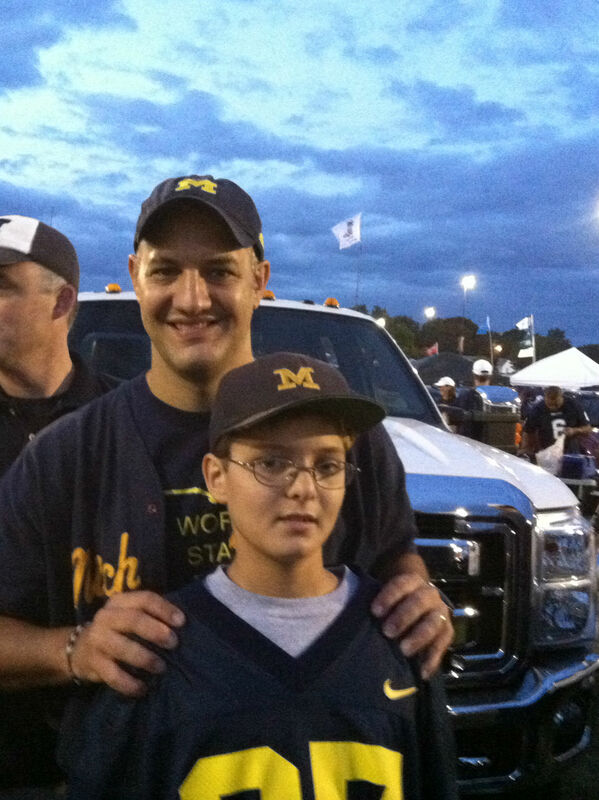 Tailgating with Ryan outside Rentschler Field Saturday night. Hockey may be the main sport I discuss here on the blog, but if you’ve hung out here for a bit you might have picked up that I have a bit of a thing for college football. Not just any college football — Michigan football. 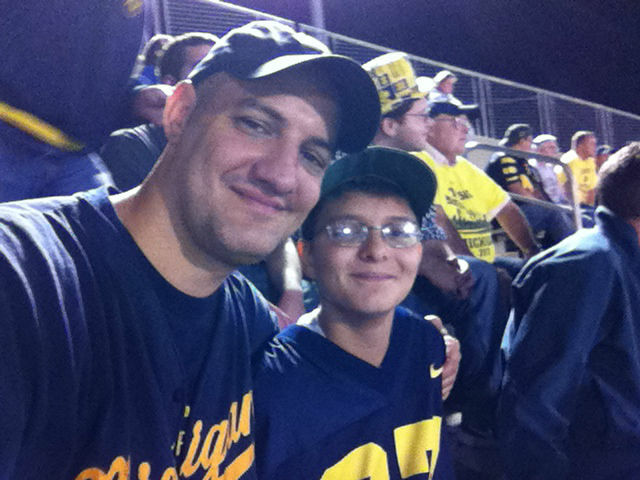 Since the day my son was born, I dreamed of taking him to his first Michigan game, of teaching him the fight song (“The Victors”) and the traditions and picking out some maize and blue for him to wear. I realized that dream back in 2009, a trip I documented in one of the first-ever entries here. Ryan was a trooper that day, but the game was more something he endured than enjoyed. It was a hockey trip with a football game thrown in. I reveled in every second of that game, even though Michigan lost, but I didn’t make any follow-up trip plans. Then last fall happened. 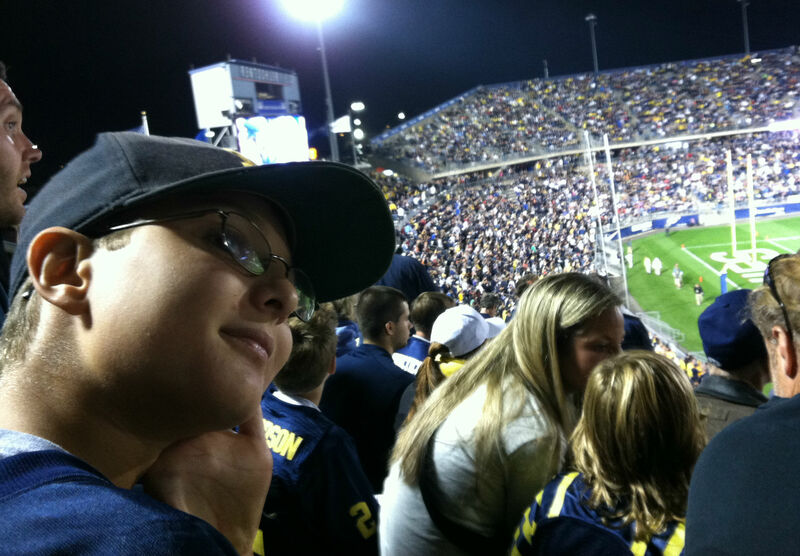 Ryan began to show an interest in football. We went to two New York Jets games, which he loved. The dream was back on. 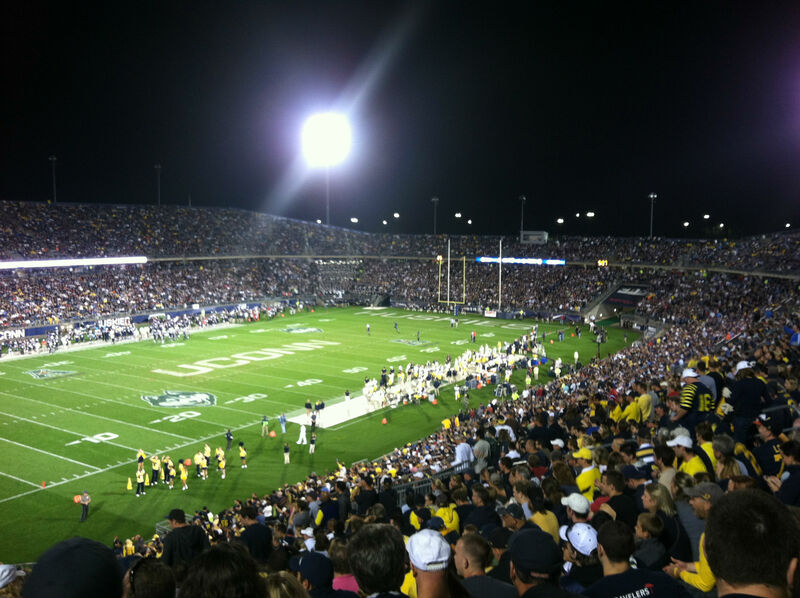 The 2013 Michigan football schedule presented a rare opportunity. For the first time since 1995, the Wolverines had a road game on the east coast, against the University of Connecticut. I quickly secured four tickets and made plans to take the family. UConn plays in East Hartford, barely more than a two-hour drive from my house. I noted that the game time was TBD when I bought the tickets but figured a noon start was most likely. The game time was announced last Saturday: 8 p.m. A night game. Not good. Veronica and Riley begged off. I put the question to Ryan: Did he still want to go? 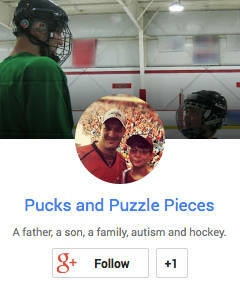 It can be difficult to get him to a 7 pm hockey game. This game would end around midnight. He hates to stay up late. He didn’t hesitate. The answer was yes. After considering the implications of driving home 130 miles after midnight, I found a hotel a few miles from the stadium. We set off after lunch Saturday and made our way through the fall foliage of southeastern Connecticut. I pointed out various cars sporting Michigan paraphernalia to Ryan. He nodded and went back to his iPad, before stopping to ask if I thought there would be more Michigan or Connecticut fans at the game. I told him I thought it would be close to 50-50. 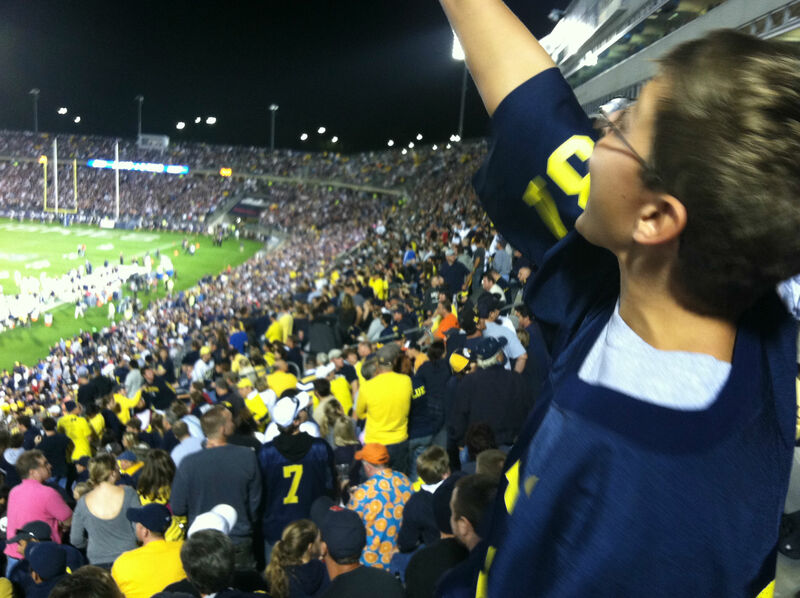 He found that unfair and didn’t like my explanation that Michigan simply has more fans than UConn, even around here. He asked if that ever happens in other sports and I reminded him of the various Devils-Rangers games we’ve been to in New Jersey where Rangers fans easily made up half the crowd. We got to the hotel and Ryan was amazed to find the lobby crawling with people wearing Michigan shirts and hats. I love to point out to Ryan the social aspects of being a sports fan, how having a favorite team in common is reason enough to strike up a conversation with a total stranger. I’ve even seen him do it, such as the time he spotted a boy wearing a San Jose Sharks hat on the New York City subway. Soon we were off to the stadium to meet up with friends at a few different tailgates. Ryan was excited to tailgate. He had some relevant experience from those Jets games, and he loves to play corn hole and toss the football. 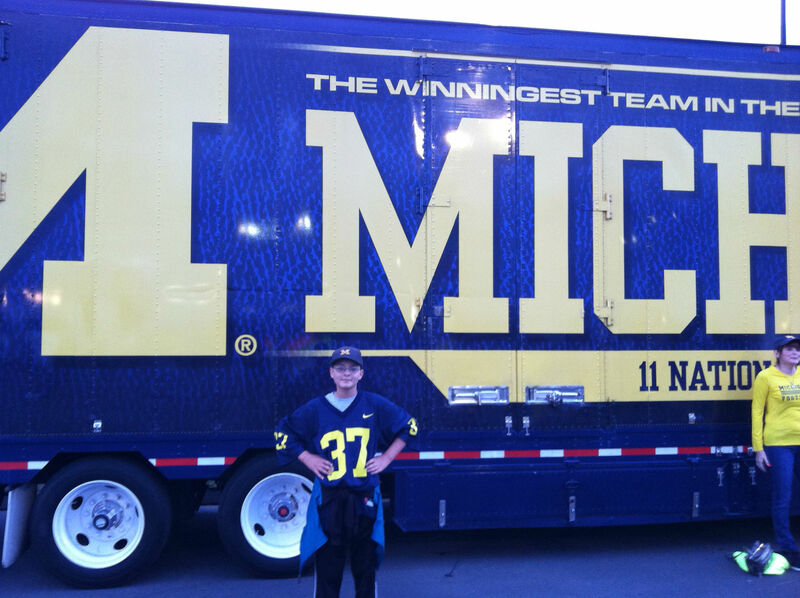 Posing in front of the Michigan football equipment truck. We quickly found the first tailgate, but there was no room for games, so he asked if we could go into the stadium. It was more than an hour before game time, so I suggested a walk around instead. We had almost completed a lap around the stadium, pausing to watch the Michigan players get off the team bus, when I ran into more friends who invited us to their tailgate. There were no games at this one either, but there was food. Ryan scarfed down a burger, putting aside the fear of eating outside that used to plague him. After a few minutes of catching up, he told me he was ready to go in. We found our seats and saw that the crowd around us was almost entirely Michigan fans. After setting off to find more food, we got ready to watch the game. The view from our seats. Michigan fans everywhere. Ryan sang the fight song and yelled along with the “let’s go blue” chant — while feeling the need to point out that Michigan was wearing white jerseys and yellow pants. UConn? They were in all blue. Point: Ryan. The game started well enough but quickly deteriorated for Michigan. When they had a fumble returned for a touchdown early in the third quarter to fall behind, 21-7, things looked grim. Michigan was in real trouble of losing to an inferior opponent two weeks in a row. Ryan remained enthusiastic, and it was impossible for me to get too upset about the outcome of a game I attended next to my son. Especially since he wasn’t just there, he was watching intently. If he had to go to the bathroom, he sprinted back up the stairs so as not to miss a single snap. A fourth-quarter interception eventually turned the tide as Michigan escaped with a 24-21 win. Ryan and I high-fived, hugged and celebrated. As we left the stadium I reflected on how far he had come since that 2009 trip. It was close to midnight and Ryan had not only stayed awake for the entire game, he stayed engaged. He followed the game closely, paying attention to details like down-and-distance and penalties. He listened as I taught him bits of football strategy, then repeated them back to me at the proper times in the game. He is beginning to understand football the way he knows hockey. He follows stats more than players, just like hockey, which makes football appealing because of the wealth of statistical data in each game. He wondered, for example, how Michigan could be losing despite having more yards before remembering that I had once told him that turnovers are the most important stat in football. At the time, Michigan was minus-4; it was a miracle they were even in the game. I was bemoaning Michigan’s poor play the last two weeks in the long walk back to our car when he reminded me of the ultimate stat. He’s right, of course. But more than that, I felt like the big winner on this night as it was impossible to worry about whether Michigan had played well. A friend texted me asking about the game. I sent back “I’ll take a thousand crappy Michigan games if I get to spend them like this,” and I included the following photo. There was indeed a “Victor” Saturday night, and it was me. the picture at the end says it all. so great this worked out…thx for sharing the story, you guys are awesome. And that picture was taken while Michigan was still losing! Thanks for the kind words. All smiles here. I have been waiting for this post and photos. I wasn’t sure about the late game time, too. So glad that they turned it around in the end. GO BLUE! !